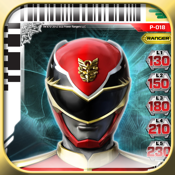 The Power Rangers Card Scanner is a must have app that has the ability to unlock videos from cards found in Power Rangers Megaforce Toys and the Power Rangers Action Card Game! Card Game Mode: In Card Game Mode, the application can be used to determine the Power Level of a card. These levels appear on the right side of each card (Levels 1 -6). To begin, point the camera at the card. When the barcode of that card is recognized, a special Power Rangers video clip will be played. That will be followed by a number from 1 to 6. Use that number to determine the power Level of that card. For example, the number 4 means the Power Level of that card is 4 as shown on the right side of the card. Card Matcher Game Mode: Click on the reel to stop it from spinning. Match all 3 cards to unlock any video on the list!